In-Map Print is a ground breaking software, showing detailed printer asset information on the end-users own interactive floor plan. An iPad application is available to colect the data at your client site faster then ever. 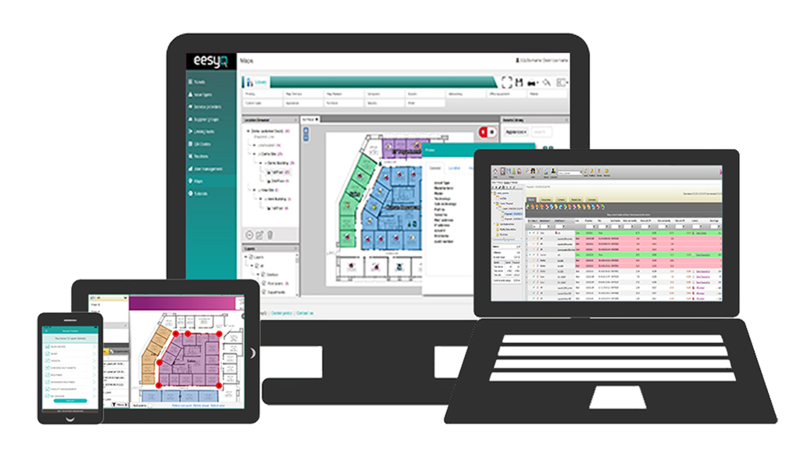 In-Map GO is an easy and effective way to map any asset within client's buldings directly on interactive floor plans. In-Map FD was created for Fire Service departments and it uses personalised Questionnaires, Icon Libraries defined by the Fire Service and automatic Reporting based on pre-defined layouts. The software enables Companies and Fire Services to cooperate in the creation and management of intervention plans. In-Map RA is a standardised tool than can be used for quickly collecting data about safety and risk assets within client's buldings. eesyQ is a cloud and mobile app based solution designed to allow collaboration and communication between end users and their service providers and suppliers. It provides a standardised platform for all workers to be able to make requests to their suppliers or their own internal organization. It includes chat back functions and can be integrated into any existing back office ERP.